Filipinos are not perfect, far from it. But is there any race or group of people in any part of the world who could claim that they are? No race is without blemish. All people, from any nation have negative tendencies and characteristics. Some may even be worse than the Filipinos. There’s no shame in accepting that one’s race is imperfect. There’s no reason to deny and hide the misgivings of a nation and its people. Among Filipinos, it is almost natural that they stress their minus points and to find fault in their behavior. Sometimes there are Filipinos who compare themselves unfavorably with Westerners by using Western standards . Perhaps somewhere in their sub-consciousness they have not shaken off yet the cobwebs of having been dominated in the past by the fair-skinned colonizers. These Southeast Asian people are aware of the negative traits they possess. They never sweep under the rug their perfect imperfections. Some of the negative Filipino traits are petty but there are also very serious ones that are considered inimical to national development and could be the reason the country is lagging behind in terms of socio-economic performance. One thing that people not familiar with the history of the Filipinos don’t understand is that some (if not most) of the negative traits this race developed through time resulted from their unfortunate and painful experiences during the colonial period. Filipinos are fatalistic. They believe that whatever happens do happen because of fate. They believe that events inevitably take place. They think that from the beginning of time set of events are put in motion and they go in the direction that they were programmed to, no deviations. Having been Christianized by the Spaniards the Filipinos developed a strong faith in God, which is a positive trait. However, they embraced almost blindly the doctrine of predestination. They believe that God exercises control over everything in the world and that He freely and unchangeably ordained whatsoever comes to pass. For them whatever happens is God’s will. Filipinos think that if a person is destined to succeed all his stars will align and he becomes what the Supreme Being pre-destined him to be. This sometimes make some Filipinos work just half-heartedly thinking that no matter how hard they try they will succeed only if such is written in their stars. They call it “guhit ng palad” or destiny. When something good happens to them they call themselves lucky (“swerte”) and when misfortune struck them they say “malas” (bad luck), shrug their shoulders off and accept their faith. The say it’s God’s will and that He allows both good or bad to happen. Their experiences during the colonization period also compounded their being fatalistic. The Filipinos during the Spanish and American periods felt that no matter how hard they would work they could go only as far as their colonizers would allow them to and have only what their conquerors would permit. Worse was more often than not that the fruits of their labors would be taken away by their colonial masters. 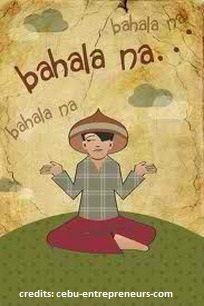 With that, they learned to live life saying say come what may (“bahala na”). They plunge into endeavors uncertain of the results and just keep their fingers crossed that things go well while assuring themselves that “God will see them through” (“May awa ang Diyos”). And why is regionalism strong among Filipinos? Why do they have this strong feeling of loyalty to that part of the country where they live? Why when in another country they prefer to be grouped with people who speak the same language they are using and eat the same foods they are eating? Why is there animosity between people living in different regions. Two of the reasons many believed contributed to regionalism among Filipinos are the following: Philippines is composed of groups of islands and the people spoke different vernaculars. This could be true but there’s a more compelling reason regionalism became part of the Filipino’s repertoire of negative traits. Both the Spaniards and the Americans had to implement policies that would ensure the longevity of their reigns. The colonizers needed to find ways to contain the colonized, keep the latter at bay and prevent them from driving the former away from the islands. As it is, thousands of islands comprise the Philippine nation, geographically it is fragmented. This the Spaniards used to their advantage in order to ensure a tight rein on the natives. It became easier for them to employ their “divide and rule” tactics. They prevented the natives from moving from one province or region to another in order to avoid fostering oneness among them. Additionally, during the times when there were uprisings in a province or a region the Spanish authorities enlisted soldiers from other geographical zones to help them quell the revolts. Technically, they made the natives fight against one another while they watched safely from a distance. This explains the animosity and mistrust between Filipinos living in different regions of the country. While the Spaniards prevented the natives from forming strong ties by literally not allowing them to move one region to another they made them kill one another. They were like Romans enjoying the view of gladiators cutting each other’s throats. Having been colonized by Spain and America, it was almost inevitable that the Filipinos would develop colonial mentality. The Filipinos tried to resist the colonizers, thus they staged uprisings but eventually succumbed to the more powerful Westerners. They had no choice but to accept the colonizers and embrace their cultures. The Filipinos grudgingly followed everything the colonizers imposed, from ideas to ways of doing things, and from manners to foods. In the process of either trying to impress or not wanting to get the ire of his colonial masters, he copied his ways, thinks that way he thinks, eat his kind of foods and wears his kind of clothes. And this was how the legendary Filipino colonial mentality started. Through the years the natives came to like and bought those manufactured by the colonizers and disregard their own. Until now this is observable among Filipinos. But those years under the Spaniards and the Americans created fondness to the colonial masters in one extreme and deep-seated resentment to them on the other. The primary objective of colonization is the enslavement of both the indigenous people and their land which is achieved either by the imposition of the colonizers’ dominant physical force through raids, expropriation of labor and resources, imprisonment, and objective murders or by sacking the cultural patterns of the native population  The colonizers of the Filipinos did exactly those to them and their country. Would the foregoing be reasons enough that the Filipinos detest their colonizers? Filipinos who know their history do not have a single strand of colonial mentality in them. There’s no love lost between the colonizers and the Filipinos who know that they deserve to have been given the right to determine their own fate as a nation and to chart their own destiny as people. Posted on October 24, 2015, in Colonialism, Filipino Values and Traits, Philippine History and tagged Colonialism, Philippine History. Bookmark the permalink. Leave a comment.